Associate Director-Commodities and Currencies at from Angel Broking Naveen Mathur gives a fortnightly trend outlook for commodities. On a fortnightly basis, global equity markets were quite volatile as they awaited Greece's decision on debt. Markets cheered the decision of the new government in Greece to drop calls for a write-down on its foreign debt and expected negotiations over bailout terms to run quite smoothly. However, the European Central Bank (ECB) surprisingly said it wouldn't accept Greek bonds in exchange for funding unless the country's officials are able to come to an agreement with creditors. The Indian rupee depreciated by 0.4 per cent owing to month end dollar demand by banks and importers. Also, uncertainty in the global markets kept investors wary. In addition, investors booked profits ahead of the expiry of January derivative contracts However, continued capital inflows amid sustained dollar selling by exporters and some state run banks restricted the downside. Further, weakness in the DX along with the optimism reflected in Asian equities supported the currency. In the past fortnight, spot gold prices declined by around 2.5 per cent while MCX gold prices rose by around 1.5 per cent. Reports that the Greek government had dropped calls for a write-off of its foreign debt sharpened risk appetite, sparking a rally in stock markets. Equities rallied around the world while the US dollar fell, as news from Greece eased concerns about growing instability in the euro zone. Prices were hit after the ECB said it would no longer accept Greek bonds in return for funding. The ECB's announcement dealt a blow to Athens which is seeking debt relief from euro zone lenders. The Greece situation increases the safe haven appeal of the yellow metal. Besides, the Federal Reserve in its meeting last fortnight said it will remain "patient" with regard to any interest rate increase decisions. After its first policy-setting meeting of the year, the Federal Open Market Committee (FOMC) said the US economy is on track despite turmoil in other markets around the world. The prospect of higher US rates could encourage investors to pull back from the metal, a non-interest bearing asset. International spot silver prices declined by around 6 per cent in the last fortnight while MCX silver prices also declined by more than 5 per cent. Fall in gold prices, declining speculative interest and profit booking at higher levels further dragged down prices. London Metal Exchange (LME) copper prices surged by 3 per cent in the last fortnight as risk appetite witnessed a renewal after Mario Draghi said the central bank would begin buying bonds worth $69.7 billion in a month. Also, The People's Bank of China lowered the required reserve ratio for banks by 50 basis points in an attempt to stimulate the slowing economy and it supported gains in the metal. However, sharp gains were capped as uncertainty over Greece coupled with profit booking hurt demand for the metal. MCX copper prices jumped by 4.2 per cent in the last fifteen days owing to the rupee depreciation. WTI and Brent oil prices rose by around 10 and 16 per cent in the past fortnight while MCX oil prices declined by around 13 per cent in the same time frame. Oil prices roared back from six-year lows in the first half of last fortnight, rocketing more than eight per cent as a record weekly decline in US oil drilling fueled a frenzy of short-covering. US data showed weekly jobless claims at a near 15-year low, indicated further strength in the world's largest economy. Prices rose on increasing violence in Libya and helped the market rebound from a rout in the previous session. Oil bulls were encouraged by BP's plan to cut capital expenditure by 13 per cent in 2015. Gold and silver prices are expected to trade lower as FOMC meeting last fortnight reiterated its stance and said that the economic optimism in the US is growing, although it maintains a patient stance on a rise in interest rates. Uncertainty in Greece with regards to its new government and austerity policies required for the country to be a part of euro zone will bring in safe haven demand and support prices. Crude oil prices have been volatile in recent weeks. This volatility will continue unless we see the fundamentals of demand and supply change for the commodity. US drillers reducing their spending on exploration of crude indicate that output might dip in the coming months. The monetary easing by the ECB might be a push factor for incremental crude demand. Since cost of oil production in the US stands at $65, operations would be unsustainable at current levels ($45) and, hence prices will have to rise in the near term. Base metals are likely to trade sideways in the coming fortnight after euro zone refused to swap Greek debt for bonds. It avoided rout from spilling in global markets, thereby renewing market sentiments and supporting demand. However, weakness in the Chinese economy in the absence of additional stimulus will exert pressure. Chana: In the last fortnight, chana traded on a positive note and gained 4.9 per cent due to good market demand and restricted supply. The new chana crop is still expected to hit the local market. 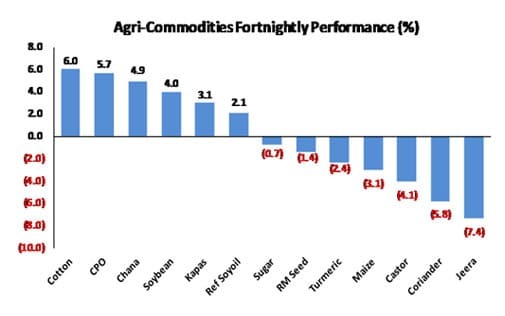 Sowing acreage for chana was lower by more than 15 per cent as compared with last year. India imported around Rs 1.54 lakh metric tonnes chickpeas during April-October 2014, which is more than 50 per cent of quantity imported in the previous year. Moreover, harvesting of chana will soon commence in southern India and Maharashtra. We expect that anticipation of new crop arrivals and good imports may keep pressure on chana prices in futures trade. Oilseeds and Edible oils: We have seen mixed to positive trend in price movement for oilseeds and edible oil over the fortnight. In the domestic market, soybean remains positive on good buying support by oil mills at lower prices and decline in supplies from producing belts. 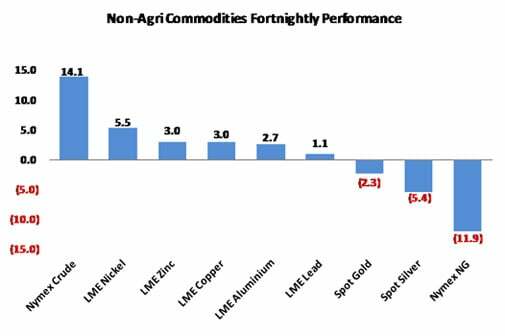 Meanwhile, global market sentiments also remained largely mixed on higher supplies expected from the South American crop as well as good export demand from China. Refined Soy oil and CPO futures prices rose mainly due to good demand at lower prices. CPO prices in international markets have surged on Indonesia biodiesel subsidy and good sustained demand from traditional markets like China, India, Pakistan and the European Union (EU). Mustard seed lost 2 per cent on expectations of a new crop arrival and good climatic conditions. Higher production of oilseeds and edible oils in world markets might keep domestic markets under pressure. Edible oil is expected to trade mixed to lower in the coming fortnight due to new crop arrivals from rabi oilseeds. 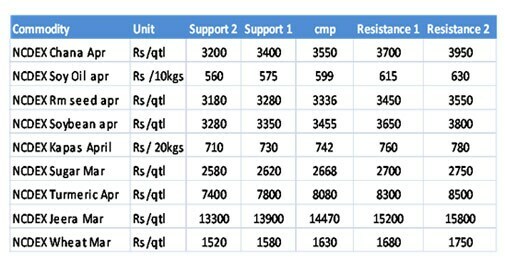 Cotton, sugar: Cotton futures gained 6 per cent due to bargain buying by market participants on lower prices and good demand from the ginners. Sugar prices have witnessed a range bound movement and closed 0.7 per cent down in the last fortnight. The output for sugar was revised by 2 per cent to 26 million tonnes for the current marketing year ending September. The government is considering extending the subsidy on raw sugar exports for the ongoing marketing year 2014/15 by giving a higher incentive of Rs 4,000 per tonne to cash-starved mills. Meanwhile, the domestic sugar production has reached 13.5 million tonnes till Jan 31, 2015, as against 11.71 million tonnes in the year-ago, a rise of 15 per cent. Cotton prices might trade sideways as the demand is good at lower prices. Sugar will trade on a mixed note on pending export subsidy and ample supply. Spices: Last fortnight spices traded on a negative note. Jeera has witnessed a drop of over 7 per cent as market participants offload positions in the futures market due to profit booking at prevailing higher levels. The new season jeera has now started arriving in the Gujarat markets. According to government data, there is 42 per cent drop in acreage in Gujarat. Turmeric traded on negative note in the fortnight as the new crop has hit the market in Karnataka, Andhra Pradesh and Maharashtra. There is subdued demand from retailers and traders at high prices at this point of time. Coriander too traded on a negative note on sluggish trading activity and reports of record sowing in Gujarat. Market participants are more interested in reducing positions amid ample stocks in the spot market against sluggish demand. In the coming fortnight, spices segment will trade on a mixed note as the new season arrival may keep prices down. However, export enquiries for Jeera and Turmeric might see good surge in prices.